Southern Living: Preppy Style: Fashion Friday Guest Post! Hey there! It's Kori from Blonde Episodes over here filling in for darling Jennifer today. I was so honored when she asked me to fill in for her, and on my favorite day of the week--Fashion Friday! Since it is Fashion Friday, I'm going to make my post Fashion related. One of the women I consider a huge fashionista lately is Olivia Palermo. Not only is she gorgeous, but has amazing style all on her own. Here are some fabulous images of her I was lucky enough to find. What do you think? She's gorgeous right? 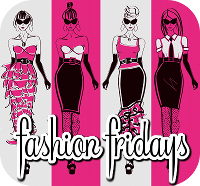 I'd love to have you go link up with us today for Fashion Friday! Oh, by the way, I have to share! My 1st novel is being released TODAY on Amazon and I'd love for you to go check it out! Thanks so much Jennifer for allowing me to fill in honey. It was an honor! Can I please have her hair style in the last photo? Love it! Absolutely spiffing blog! Do you know where I may purchase "temple garments"? She really bothers mebecause of The City hehe. Wonder if she's really that miserable in real life? Ether way, girl has style that cannot be denied! Thanks for sharing and love the photo of you(?) with your little girl in your neighborhood - how sweet! She is so effortlessly chic! can't stand her as a person, but she has the BEST style.